← Theatre Ballet Pointe Shoes-From Moscow To New Jersey? A little more than a year ago, I made a post under the Miniature Pointe Shoes category about a cute little pair of mini-pointes with the brand name Dancin’. You can see the post here. I mentioned the fact that if a company makes a miniature shoe, there is a great possibility that they make a standard size too. Almost 13 months later, the adult-size Dancin’ model has been discovered! 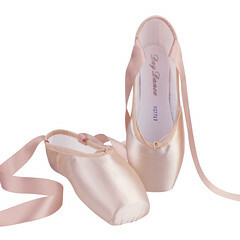 Dancin’ pointe shoes come with suede toes and wide platforms. They are a beautiful pale pink satin and very pretty to look at. They are advertised as suitable for beginners with an easy-to-break-in sole construction. 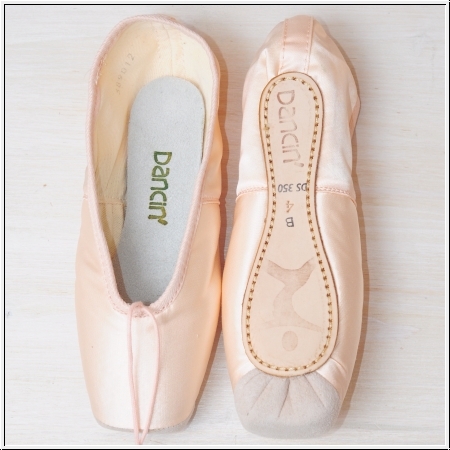 Compared to the soft ballet slipper, the pointe shoe models are imprinted with the image of a dancer’s head, torso and upper thighs. I should have turned the photo upside down for easier viewing. There is no clue by the photo whether these shoes are hand-crafted or machine-made. Although I am very pleased to see that Dancin’ makes a standard shoe, there are a lot of mysteries yet to solve with this brand name. A Lot. In fact, the Dancin’ brand has me spending extra time online trying to dig up detailed information about the company origins and history. I am so eager to learn more about Dancin’, that I don’t even care if the information is detailed. Just give me something, please. 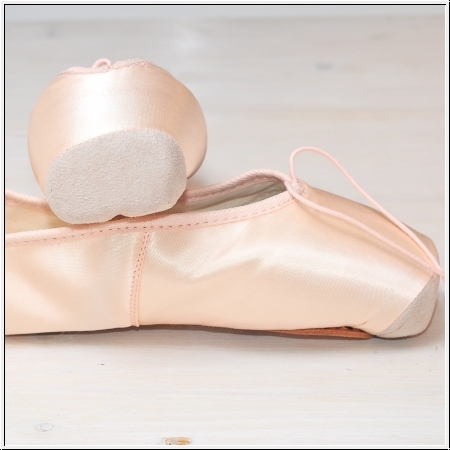 I found the pretty pink satin Dancin’ model advertised on a German-based dance supply website. 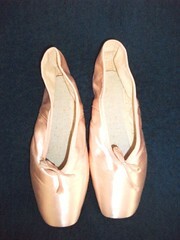 The company, Danskult of Germany, was gracious enough to reply to my inquiry about the pointe shoes quickly. The problem? They themselves do not know where they are manufactured. 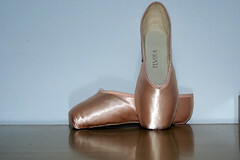 If you want to see the website where Dancin’ pointes are sold, visit Danskult.de. Why does this global distribution of pointe shoe brands make categorizing origin of brand a bit crazy? Distributors simply do just that; sell another company’s shoe from their store. Dancin’ products could be made in Japan, making them a Japanese brand distributed in Germany. They could be Chinese, Mongolian, Swiss or Icelandic. Somewhere in the world, there is a factory making Dancin’ dance shoes. 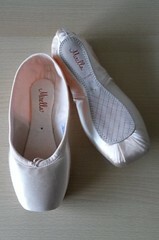 These lovely white ballet slippers are now being sold on Germany’s version of Amazon.com. 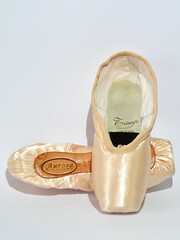 The mystery deepens as this brand cannot be found on any American or U.K. sites like other European pointe shoe brands. 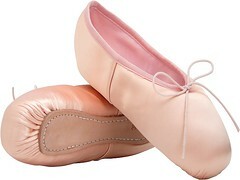 These white ballet slippers by Dancin’ are available on Germany’s Amazon.com. 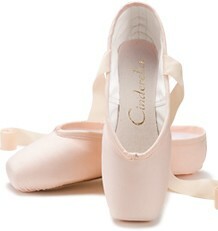 I could not find them on American dance supply websites. For now, I will assume that Dancin’ is a German product made in Germany and mostly sold in that area of the world. I will add it to the sidebar as a German brand and a mystery brand, unless I learn otherwise. This Fraulein would love more info about these pretty spitzenschuhe marken Dancin’. This entry was posted in German Brands, Mystery Pointe Shoe Brands and tagged Dancin pointe shoes, German pointe shoe brands, pointe shoes made in Germany, spitzenschuhe marke Dancin. Bookmark the permalink.